So, are you at risk of developing ulcers? Understanding the common risk factors and causes of peptic ulcers is important for your healing. If any of these is/are causing your ulcers, then it makes sense to remove them in order to start healing and preventing recurrence. H.pylori infection is the leading cause of peptic ulcers. According to the CDC, this bacteria is the cause of almost 90% of all duodenal ulcers and close to 80% of stomach ulcers. H.pylori is also a big cause of many cases of acid reflux, thus cabbage juice has been found to be soothing for sufferers of this condition. The conventional treatment of peptic ulcers heavily relies on at least two powerful antibiotics (with an optional third one) – everything in order to eradicate that pesky bacterium from one’s gastrointestinal tract. Fresh, raw, cabbage juice is the secret. Yes, it works, and this is a scientifically confirmed fact with almost 70 years of history. Let’s take a closer look. Just so you can imagine how “rapid” the healing is: Cabbage juice fixed peptic ulcers in as little as 7 days while conventional therapy will take way longer with no promise of a cure! In a pilot study, thirteen subjects between 26 and 72 years of age were involved. They were diagnosed with gut ulcers bearing a “crater” which was defined on an X-ray. These craters were grouped as small (3 to 5mm in diameter), medium (6 to 8mm), and large (9 to 21mm). A specific dietary regimen was prescribed to each of them to ensure exclusion of other possible food sources containing the anti-ulcer vitamin. Each subject was required to drink not less than one liter of green cabbage juice daily. The drink was apportioned into 5 servings of 200ml (about seven ounces) each, to be drunk throughout the day. The patients were also encouraged the use of salt, pepper and tomato juice for seasoning purposes. Three subject received juice portions containing 75 percent of cabbage and 25 percent of celery (celery also contains vitamin U). Further astonishing results could be witnessed in two of the conditions; one subject had three small gastrojejunal ulcers, and the other was affected with two such gastric ulcers. Both the subjects revealed healed guts upon the second gastroscopic examination following the cabbage juice therapy. The author of this amazing study, Garnett Cheney, emphasizes the fact that heating destroys vitamin U. Hence, foods aimed to treat ulcers must be eaten raw and not subjected to cooking. 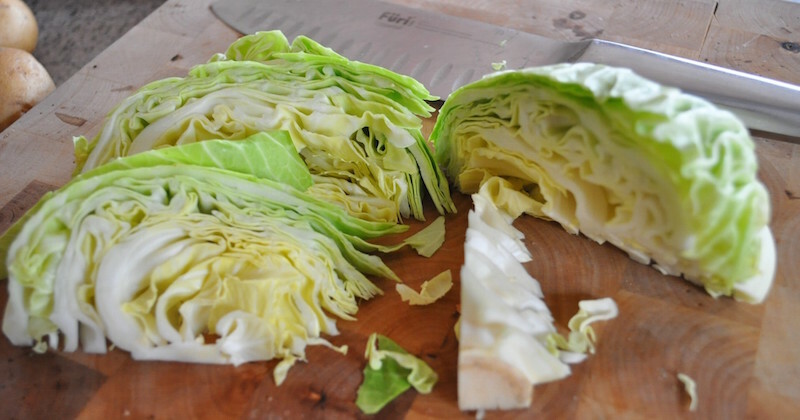 Cabbage consumed in juice form is the best remedy for the cure of ulcers. Dr Garnett supposed that cabbage juice is rich in some kind of anti-ulcer factor, so he proposed to call it vitamin U (for ulcers) until more data is available on the chemistry of the substance. Vitamin U boosts the production of mucin, the primary component of the mucus secreted by the mucous membranes. Essentially, this helps to maintain a protective layer on the surface of the esophagus, stomach, and guts. Naturally, this helps to prevent the formation of ulcers and heal existing ones. Vitamin U has significant cell-protecting properties, most likely due to its chemical formula with several sulfhydryl groups. It is believed that these compounds work as antioxidants and help to balance local immunity. Another powerful anti-ulcer agent in cabbage juice is known as sulforaphane (yep, the same substance that treats autism and heals cancer). This compound is a powerful bactericide that’s incredibly effective against Helicobacter pylori, which is the bacteria responsible for the vast majority of all peptic ulcers. The effective dose of sulforaphane for the eradication of H. pylori is believed to be around 100 mg daily for adults. Although cabbage doesn’t have as much sulforaphane as broccoli sprouts, it still contains enough of the substance to bring significant relief for H. pylori infected ulcers. Glutamic acid is a non-essential amino acid, meaning that the body is capable of producing its own glutamic acid and is not dependent upon getting it from food. One of its main roles is to serve as a neurotransmitter to help with transmission of nerve impulses that are involved in learning and memory. A deficiency in glutamic acid can lead to compromised gut integrity (leaky gut syndrome) and a poor immune system function. This is another reason why cabbage is so good for the health of the intestines. Last but not least, cabbage juice is rich in vitamin C, a potent antioxidant that captures and neutralizes free radicals. This is extremely important since free radical damage is an important component in the development and worsening of gastric ulcers, duodenal ulcers, and even stomach cancer. Did you know that peptic ulcers and skin lesions are very similar in terms of tissue damage? This fact explains why there is evidence suggesting that vitamin U significantly accelerates the healing of wounds when applied directly on the skin. Basically, you can soak clean gauze bandages in fresh cabbage juice and make natural skin-healing dressings this way! This may come as a surprise, but it’s actually a scientific fact: Vitamin U inhibits the formation of adipocytes (fat cells) on a molecular level. This means that cabbage juice could help to lose and control weight through a whole different mechanism of action that has nothing to do with calories and macronutrients. Although this effect is still to be confirmed in human studies, it still sounds incredibly promising! Thanks to its antioxidative, anti-inflammatory, and antifibrotic (prevents the formation of scars in the tissues), vitamin U has shown great potential in the prevention and treatment of kidney damage. Antioxidant is especially effective against toxic damage, for example, the one induced by conventional drugs such as valproic acid for the treatment of seizures. Although this last point doesn’t have a lot of scientific data to back it up yet, there is some evidence suggesting that vitamin U effectively soothes depression regardless of its duration and previous treatment. There’s reason to believe this is true because another substance with a VERY similar chemical structure has been confirmed dozens of times to have anti-depressant properties. Cabbage juice on its own actually tastes sweet, but it has a distinct after-taste that may not be pleasant for some. Father of Juicing, Jay Kordich, worked with Dr Garnett Cheney in giving cabbage juice to prisoners in Alcatraz and every one of them were healed of stomach ulcers. In the study, only the green cabbage was used. Always use only organic ingredients. Wash, cut and put these ingredients through your juicer. Using a slow juicer will provide a higher juice yield compared to a centrifugal juicer. 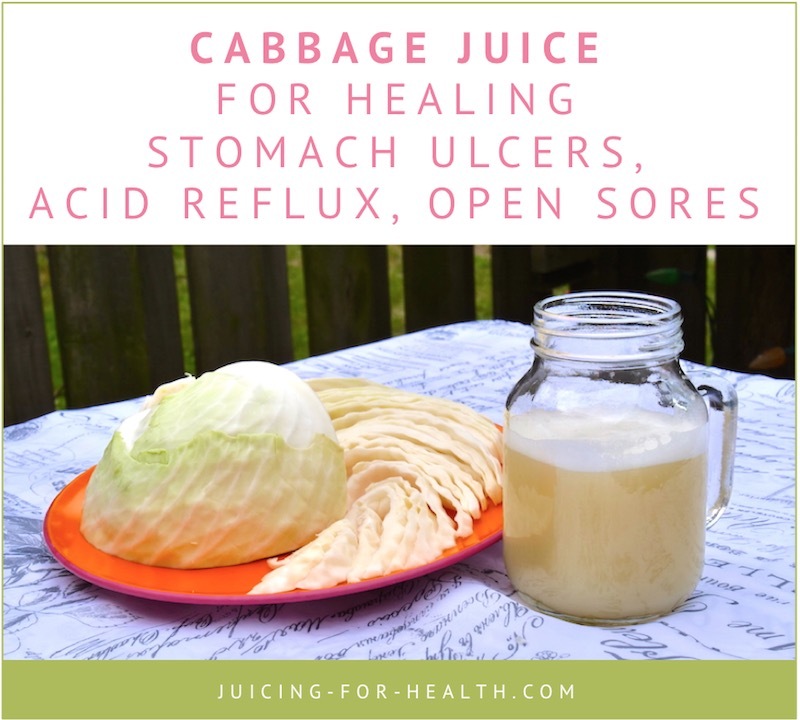 How much cabbage juice to drink for healing of stomach ulcers? To make cabbage juice to suit your palate, you may also add other vegetables – cucumber, broccoli or a green apple are all good options. Just be sure to use one small head of cabbage that should yield about one liter (or one quart) of juice. Of the one quart of juice (or more, if you added other vegetables), split them into 5 servings to be drunk throughout the day. For how long should you drink cabbage juice for healing of stomach ulcers? For healing of any health conditions, always stop the offending foods for unhindered healing. As per the study, many patients felt less pain after drinking the juice for two or three days. Depending on the severity of your ulcers, you may drink the juice daily, anything from seven up to 21 days. Then, get checked again. “Let food be thy medicine” said Hippocrates, the ancient Greek healer, over 2000 years ago. Sadly, this principle has been widely neglected for decades, but with each passing year more and more studies emerge to prove it right. Today, everyone has the power to bring natural healing into their life using simple, understandable, and affordable foods. You just have to pick the right foods for each specific condition, and the results will last. Thank you for your cabbage recipe. I am in distress right now – desperate for some relief. Going out of town with my daughter this evening. On my way to the grocer now to get the ingredients. Praying for some relief. Thank you so much! Hi Denise, cabbage juice works. All the best to you and God bless!